Once again, it’s time for a weekend of frivolity and technology that we call “CarolinaCon”. While I was sure that doing so would put me on some secret list of persons-to-watch, I made plans to attend. As usual, the Con spanned the weekend, from Friday evening until Sunday evening. Here’s my impressions. The professor always does such a good job of easing the crowd out of reality and into the “Con-zone”. 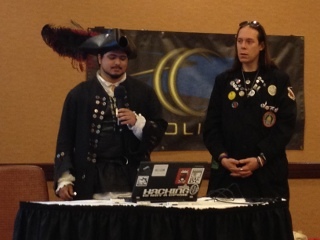 His presentations are academic, but touch on hacker culture. This year, he gave questionnaires to college students to determine correlations between their attitudes on protesting and hactivism across two dimensions: domestic-vs-foreign and physical-vs-virtual. Georgia explained how Android phone apps implement “intents” or services, and then how to inspect an Android app to see its contents. Using these two pieces, she was able to write unprivileged apps that use another app’s higher-priviledge services. Ronin has assembled a wide array of open source Bluetooth tools into a Linux distribution that he calls “Blubuntu”. He showed the basic usage of some of these tools, with some good background info on how the protocols work. A good overview talk! The original plan was to end the Friday night session with a round of Hacker Trivia, but the schedule was abruptly changed to include this entertaining talk from Deviant Ollam, whose talks usually center on lock picking and air travel (and they usually include alcohol). This year’s presentation did not disappoint — the topic was the “Mile High Club”, with a complete survey of logistics, opportunity, and suggestions for flight timings and choice of aircraft. Once they cranked up the volume on Snide’s mic, he walked us through several ideas for planting malware into a software development environment, implanting your payload at the source. This talk discussed how we can watch what malware DOES rather than trying to match against signatures. Big-O showed some nice visualization tools, like thread graphs. Vic and emwav enumerated several ways that companies and employees can escalate the arms race… employees can steal proprietary information, and employers can make it difficult. The bottom line for me was that this arms race is stacked in favor of the attacker. Apparently, someone told this group that CarolinaCon was a costume party. The pirate and the doctor win the prize for best costumes. But pay closer attention. These guys are smart — they have scoured the internet for cool mesh networking tools, and they have packaged them into a LiveCD distro called “Byzantium”. Imagine a disaster or political unrest scenario, where you would like to mesh together a group of users and share an internet connection. Keep an eye on this fledgling project. Gmark has been keeping his eye on the geopolitical landscape and how different nations approach info security. He has insights into the capabilities and motivations of the different players, and he observes recent cyber-attacks that have shaped the new balance of powers. Where do we draw the line between hacking and warfare? Joe warns corporate America that we should stop focusing on the vulnerabilities, stop patting ourselves on the back when we’ve checked all of the patch check boxes, and instead focus on why an attacker would be interested in their companies to begin with, and prioritize based on the value of the assets (illustrated with a colorful analogy about driving through the ‘hood). This talk had a lot of promise, because the subject matter is wide open for thought-provoking stories. But I felt like this talk left more loose ends than tied-up ones. One of the best talks of the show, and it was not even about security! Dr Tran recently moved to Zurich, and he recorded his impressions and shared them with the Con attendees. Much like hacker trivia in previous years, but I noticed three differences. The game was more lightly attended than at previous cons. Many of the questions went unanswered (meaning Vic had to take a drink). And most disappointing, Al did not emcee. This talk was canceled. Instead, we heard from some UNC-Charlotte students on the accomplishments of their hacking competition team. Deral Heiland has made a career out of keeping printer manufacturers on their toes. This time, he decomposes a firmware update package for Xerox printers, and he creates his own update that includes his “modifications”. Branson shows how easily we can be socially engineered. It happens every day, from advertisers, authority figures and administrators. He shows us how to recognize when we’re being manipulated, and he encourages us to know our rights and responsibilities so we can limit our exposure. Case studies of real-life compromises, in spite of the sophisticated defenses employed. Omar discussed the challenges that are encountered by large organizations with wide networks and hundreds of assets to manage. OK, the RaspPi is a cheap small computer. We get that. DJ Palombo seems to think that the revolutionary concept is that its low profile and disposability make it a good “bug” or or hidden node for hacking. Thanks to the organizers and presenters for another memorable Con!